Signing off and toasting: To being concerned about real health risks (and benefits), and not blowing things way out of proportion! You may have seen the headlines this week that coffee must be labelled as a carcinogen in California. You and I – we’re concerned about our health, and the health of people we know & love. If you’re like me, you’re particularly concerned with the risk of getting cancer. Cancer is in my family – on both sides. It’s a much bigger concern for me personally as I get older. I adamantly try to instill some major cancer-prevention healthy lifestyle habits in my kids. Plus, it’s already affected two of my friends who are my age. In fact, my interest and enthusiasm to earn two university degrees in biomedical toxicology was partly based on my family history (and my personal potential risks) of getting cancer. 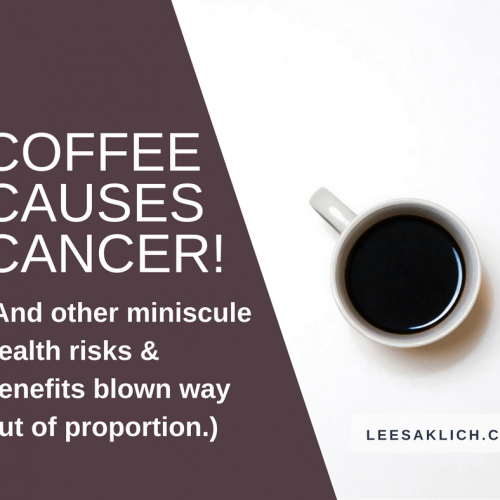 If you’re concerned about health risks, and cancer, you want to know what research these “coffee causes cancer” headlines are based on. And whether its true… or even reasonable. Let’s dive into some of the research to uncover the real risks. NOTE: This is not a critique of regulations created by presumably well-meaning health-conscious people. This post is to understand how focusing on tiny and miniscule amounts of things in foods can be scary, and become blown out of proportion. Coffee is a natural food, created by picking beans off a tree, roasting & grinding them, immersing them in hot water (by percolating, pressurizing, or steeping), and drinking that water. Coffee, like all foods, is a complex collection of many different compounds. Just like turmeric (the food) is not curcumin (the extract), coffee is not a purified & concentrated form of one single compound, like caffeine. Nor acrylamide (which is the compound of concern in California). Coffee contains over 1,000 compounds! If you don’t already, I highly recommend following Compound Chem on Twitter, Instagram, Facebook, and/or Pinterest! Some of these compounds in coffee, in isolation, in high doses may be linked with health risks and/or benefits in rodents. A quick PubMed search found a very recent review study published on coffee. This study reviewed a number of studies that looked at the health of many, many people who drink coffee regularly: Coffee for Cardioprotection and Longevity. NOTE: This review was NOT based on one isolated concentrated component (e.g. caffeine or acrylamide), nor on rodents, so it’s a fairly strong study to use here. The researchers state that drinking 3-4 cups per day seems to not only be safe for most people, but also provides the most health benefits. Granted, these health benefits and risks are correlations, not causations. This means that in most of these studies, researchers have asked people how much coffee they drink, and looked at their health. These are not true clinical experiments (e.g. randomized control trials, RCTs) where people are randomized into a “coffee” group and “placebo” group. 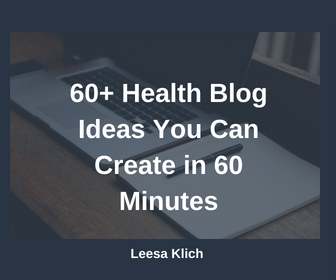 Then they agree to drink a certain amount of their coffee/placebo for a certain amount of time, all the while, their health is being closely monitored for any changes. If we do a proper clinical trial and make a change (i.e. “intervention”) in people’s lives, like having them agree to eat/drink/take something differently than what they usually do, THIS is how we become very sure that it’s the change in what they ate/drank/took is what later CAUSED the change in health. These types of experiments are ones that could show real cause-effect. These are rarely, but sometimes, done in nutrition studies. Although AA was shown to be carcinogenic in both male and female rodent models, numerous studies reported no statistically significant association between dietary AA intake and various cancers in humans, e.g., pancreatic, prostate, breast, ovarian, and endometrial cancer. What this means is that acrylamide has been shown to cause cancer in rodents. These studies usually use high levels of the purified substance and expose animals to it in specified doses. “Dietary” acrylamide in humans is the acrylamide we get from our diets. Not purified forms, like used in rodent studies. It’s also in regular food and drink-related doses, not artificially high doses like used in rodent studies. According to studies like these, there has been no link to people eating or drinking regular amounts of acrylamide and increased risks of pancreatic cancer, prostate cancer, breast cancer, ovarian cancer, or endometrial cancer. Few studies reported possible association between dietary AA intake and cancer risk. This means there may be an increased risk for cutaneous malignant melanoma in men, lymphatic malignancies in men, esophageal cancer (particularly among overweight or obese individuals), and increased overall cancer mortality in digestive and respiratory system cancers in elderly Chinese people. Now, when scientists say “may” they mean that there might possibly be a small chance, but the association is weak and barely statistically significant. Basically, it’s possible, but unlikely. Because you can’t completely prove that something does not exist, you look at the strength and quality of the information that something does exist. The research studies conducted on AA described the potential health risk of fried and baked carbohydrate-rich foods. There is clear evidence to show that AA is carcinogenic in rodents. However, there is paucity of facts depicting the health risk in humans as evident from numerous epidermiological and toxicological studies. OK – so dietary acrylamide, a natural substance created from cooking carbohydrates, may have a small chance of increasing the risk of some cancers. So, in the world of being exposed to 1,000 compounds in one cup of coffee, and thousands, or millions more throughout every single day. What should we be worried about when it comes to cancer causing compounds? So, you should be far more worried about cigarette smoke and alcohol, rather than acrylamide in coffee. *Yep, “causes” is in quotations because, y’know, correlation does not equal causation – so this info is based on mostly correlations, not causal ones. Can’t expose people to carcinogens on purpose to get a 100% certain causal conclusion! Let’s look at this whole “miniscule health risks blown out of proportion” another way, shall we? Well, let’s look at whether beer is, in fact, a good source of B-vitamins. A + B = Beer is a good source of B-vitamins from whole grains… Ummm, nope! First of all, if we look at beer, not as a complex source of hundreds of compounds, and just look at the B-vitamins, beer isn’t a great source of B-vitamins. So, how many ounces of beer do you need to get your RDIs of these essential vitamins? Thiamine (vitamin B1) = 1,200 fl.oz. Riboflavin (vitamin B2) = 185.7 fl. oz. Niacin (vitamin B3) = 105.3 fl. oz. Pyridoxine (vitamin B5) = 121.4 fl. oz. Folate (vitamin B9) = 200 fl. oz. Cobalamin (vitamin B12) = 240 fl. oz. As you can see, yes, there are tiny amounts of B-vitamins – the highest amount translates to needing only 105.3 fl. oz. of beer to get your day’s supply of B3! (And even more oz/day for all the other B-vitamins!). But, if we step back and look at beer as a complex mixture of many, many compounds including water, alcohol, etc. we remember from the chart of cancer risks above, that alcohol is a cancer risk! So when referring to a health risk or benefit of a food, we need to look at the health risks and benefits of… that food. Not the health risks and benefits of a tiny amount of one compound in that food. But, in some, rare cases, being exposed to a miniscule amount of something can in fact be a health risk! If a miniscule amount of a compound goes a long way to negative health consequences, these are “hazardous” and should be heeded. Other than food safety issues, the most common reason to make a big deal of a tiny amount is for life-threatening allergic reactions like anaphylaxis. Even traces of gluten should be avoided in the cases of diagnosed celiac disease. This is an extreme example where a tiny dose can be a big health risk. I’m concerned about health and carcinogens too! There are circumstances where miniscule amounts of things do pose a health risk (if the hazard is very high) – like in anaphylactic allergies. Much of the time, though, we don’t need to be so worried about health hazards. And same goes for benefits – much of the time, there is no miracle “drink beer for its B-vitamins” either. Is cancer a huge concern for you, like it is for me? Do you go out of you way to avoid certain carcinogens? Any questions about toxicology? I’d love to know (in the comments below)! This is such an amazing article, I really enjoyed reading it! You highlight some valid points here and it just shows that the news are just news, we shouldn’t believe everything what we read especially when it comes to health.